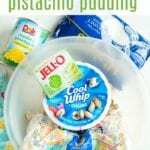 Pistachio pudding ambrosia is an amazing side dish or dessert! A cross between your favorite pistachio pudding and marshmallow ambrosia, you’ll love it too. If you’ve ever made our easy ambrosia recipe you know what a yummy treat that is. 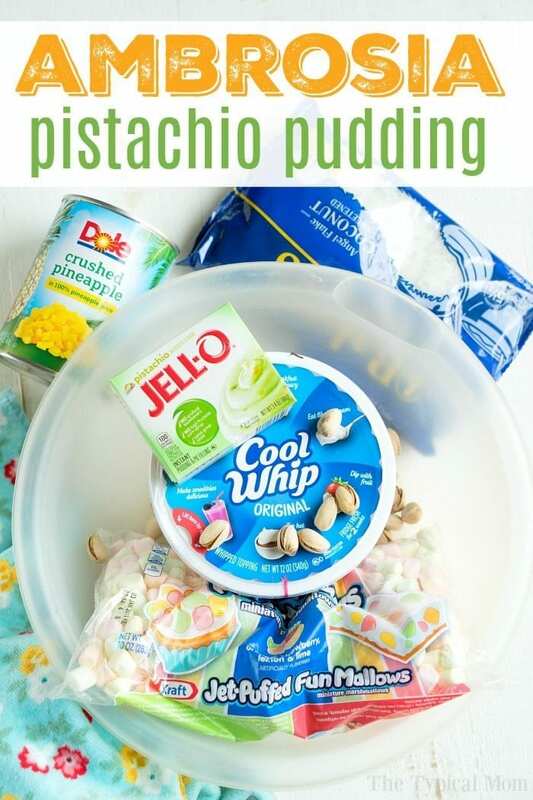 If you love pistachio pudding you’ll love this cross between them both I came up with when I wanted to bring something new to Thanksgiving dinner last year. I called it pistachio pudding ambrosia and it was a hit! We serve things like this as a side dish during the holidays and Easter just wasn’t the same without my aunt’s ambrosia salad! My sister in law has the same memories but with pistachio pudding so we always ended up with both on the buffet table which was great but I thought….a mixture of a sort of pistachio pudding ambrosia would be amazing I bet….so I set off to try it. This is what it looked like……. Of course you can get the white mini marshmallows but really, the rainbow ones are just so much prettier. I will say it is sweet! 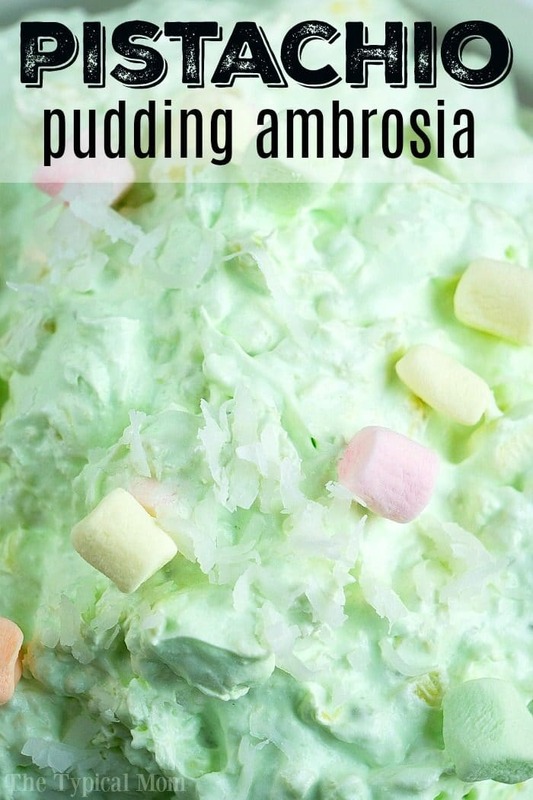 Pistachio pudding ambrosia is an amazing side dish or dessert! A cross between your favorite pistachio pudding and marshmallow ambrosia, you'll love it too. Fold together whipped topping and pistachio pudding mix until well blended. Empty can of crushed pineapple into this mixture and fold in gently until combined. 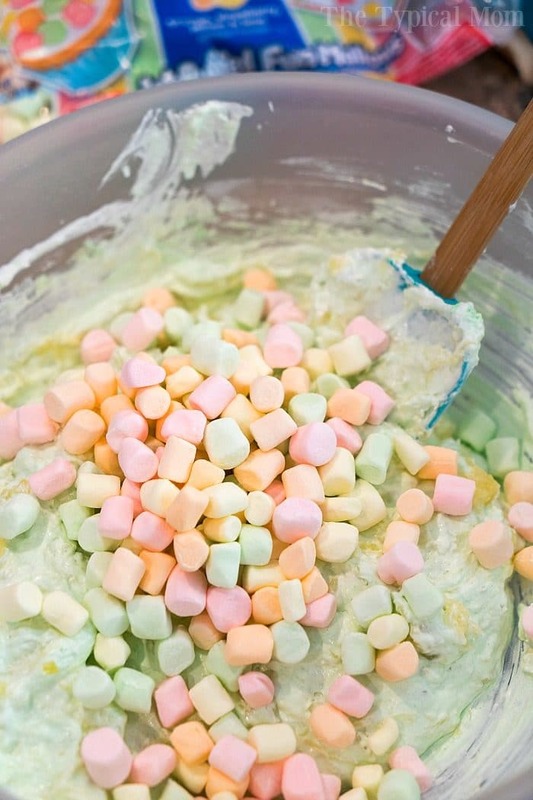 Gently fold in mini marshmallows, mandarin oranges, and coconut until combined. Best when refrigerated for at least an hour but you could make it in the morning and serve it in the evening too easily. If you think it is a bit too thick for your liking then add back in some of the drained mandarin orange juice to loosen it up. Sprinkle crushed pistachio nuts on top for garnish, can add a few marshmallows on top too to make pretty + a light sprinkle of coconut. Looks great but one question, you don’t need to make the pudding first, you just dump the pudding mix in with the cool whip? Exactly, you do not make the pudding according to the package. Correct, do not make pudding according to directions.